Slightly edited version of article originally published under the title, "How Much Does a Bullet Cost to Turkish Army?" 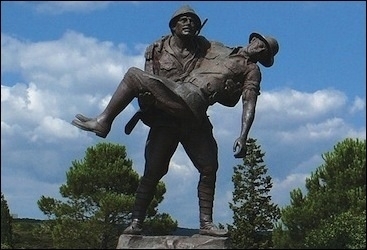 Turkey's Respect to Mehmetçik Memorial depicts an Ottoman soldier carrying a wounded Australian adversary to safety during the fighting at Gallipoli in World War I. "If a state is mighty but not compassionate, that state will become a tyrant [state]," Turkish Prime Minister Ahmet Davutoğlu remarked on May 20. The prime minister was absolutely right. As we go through days when bullets fly in the air and kill our young ones daily, I recalled an unknown bullet story that hopefully will reach the ears of the prime minister when he speaks of our "compassionate" state. Barış Gözen was born in 1988. He was conscripted to serve in the Turkish army guarding northern Cyprus in Kyrenia. On Feb. 18, 2009, his unit returned to its barracks. It was just another ordinary lazy day to pass time. As the unit entered the barracks, its commander neglected to order one simple essential safety rule: unload the bullets in your rifles. Barış was sitting on a corner chatting with a friend and holding onto his rifle when it fired. The bullet pierced through his right shoulder and exited his neck, irrecoverably damaging his spinal cord. At 21, Gözen was not able to walk or use his arms and hands, not even able to sign an official document necessary for the legal proceedings. He could not, and still cannot, move any part of his body below the neck. Medical reports said that Barış was "100 percent disabled" and in need of "lifetime medical support." Barış is doomed to his sickbed forever, totally paralyzed. Too tragic for a 21-year-old and those who love him. At this point our "compassionate" state comes into the picture. The military prosecution prepared an indictment into the incident, signed by a judge/major who I shall name with his initials, "I.K.". Did he charge Barış's commanders for negligence of duty? No. The military prosecution accused Barış of "making himself unfit to do his military service." The prosecution said that Barış's unintentional firing of his rifle (and making himself totally paralyzed for the rest of his life) could earn him a prison sentence for "making himself unfit to do his military service." But the merciful prosecution said it found no evidence for an intentional self-shooting. Thank you, dear, compassionate prosecution! Barış will be grateful to you forever for staying in his "free" bed instead of a prison bed. But the compassionate prosecution asked for a sentence for Barış for "disobeying orders." The judge/major really wanted Barış to be in a prison bed instead of a home bed. But now fasten your seatbelts and read what the prosecution also asked for: That the state treasury's loss of 1.85 Turkish Liras (66 cents) for the bullet Barış unintentionally fired and shot himself had to be collected from him. The compassionate state! Miraculously, the military court acquitted Barış on charges of "making himself unfit for military service and disobeying orders" but it also referred the case to his military unit for the collection of the 1.85 lira loss – the cost of one bullet. Perhaps we all should send 1.85 lira each to the mighty Turkish military and the compassionate Turkish state. The invoice should read: "This payment was made to compensate for the single bullet that paralyzed Private Barış Gözen." But your columnist bets that no military or civilian official would feel embarrassed. On the contrary, they might even feel happy to have generated surprise funding to buy more bullets. In the past six years Barış has been doomed to his bed, while his legal struggle to win compensation for the negligence that caused his tragedy continues on. An expert report found that he should be paid by the state a mere 129,000 liras (about $46,500) for the proven negligence that doomed him to his sick bed forever. That is in contrast with an earlier expert report that called for compensation of 1.026 million liras ($369,000). Barış will never recover from his bed. But his legal adventures against a "compassionate" state will possibly continue on. So far, so good. Barış should learn to be grateful. He could have been having his legal adventures against a compassionate state from his prison hospital bed, instead of the bed in which he is doomed to die. Burak Bekdil, a fellow at the Middle East Forum, is a columnist for the Turkey's Hürriyet Daily News.